Listen to our May 1997 UFC show, reviewing UFC 13. May 30th 1997, live from the Augusta Civic Centre in Augusta Georgia, it’s UFC 13: Ultimate Force! Despite their age difference, UFC legends Tito Ortiz and Randy Couture, who were 22 and 33 respectively, both made their MMA debuts on this show. Our host are Bruce Beck and Jeff Blatnick, who run down the format of the show. We have two four-man tournaments, one in the lightweight division (200lbs and under) and one in the heavyweight division (over 200lbs). Our main event is a superfight between Vitor Belfort and Tank Abbott. Big John McCarthy is of course the man in charge in the octagon, Bruce Buffer is the ring announcer and Joe Rogan is on hand for the backstage interviews. We kick things off with the lightweight tournament semi-finals, but not before the camera pans over a sign in the crowd which reads ‘Shamrock is a sell-out’ in reference to his recent WWF debut. The first semi-final is the longest fight on the show, featuring two guys with previous UFC experience in Christophe Leininger and Guy Mezger. Leininger lost to Ken Shamrock at UFC 3, with Mezger picking up wins at both UFC 4 & 5. This wasn’t a great way to kick off the show, Leninger was incredibly defensive with Mezger comfortable in dealing with an opponent who barely made a single proactive movement in the fight. At this stage in MMA, it is evident that wearing a gi in the octagon is a bad idea, as Leninger struggled with his throughout. We had the full 12 minute regulation and 3 minute overtime period in this one, before the judges awarded Mezger the unanimous decision victory. In our second Lightweight semi-final we have two guys making their UFC debuts with Enson Inoue vs. Royce Alger. In his pre-fight hype video, Inoue spoke about how he feels Alger is clueless about submissions, and he was right on the money. After just 1:36, Inoue was able to pick up the victory via submission after locking in an armbar from the bottom. Alger tried to deadlift Inoue to escape but didn’t have the strength to fight out of such a compromising position. This was a short yet exciting fight that was a much needed change of pace after the opening fight plodded along. After a Tank Abbott video package which looks back at his UFC career so far, we move straight into the heavyweight tournament semi-finals as Steven ‘3D’ Graham takes on Dimitri Stepanov. 3D stands for doom, despair and destruction and with that I am completely sold on Steven Graham. Just 23 years’ old, 6’1 and weighing 290lbs, he has the absolute look of a star. Graham immediately landed a ferocious body slam into side mount. He seemed so agile closing in for it, and showed serious power in getting the takedown. Graham traps Stepanovs’ arms, worked for a keylock and slowly ground him down for the submission victory after just 1 minute and 30 seconds. Graham really lived up to my personal pre-match hype here. I am so surprised that he never fought in MMA again after this night. He looked right at home here, and alternatively seems tailor made for professional wrestling. We head straight to our second heavyweight semi-final, which sees a 33 year old Randy Couture make his MMA debut on just 3 weeks’ notice. The UFC legend would go on to become the first of only three men to hold UFC Championship’s in two different weight divisions. His opponent is also noteworthy: Tony Halme, who was listed as a shootfighter but is probably best known as Ludvig Borga, who appeared in the WWF in 1993-1994. As Bruce Buffer runs through the introductions, the announcers plug his recent appearance on Friends, which you can hear us discuss in great detail on the May 1997 MMA 20 Years Ago Podcast. There’s a reason Randy Couture is known as 'the natural'. This was a very impressive debut as he decisively beat an opponent who significantly outsized him here. Couture took him down with ease, controlled every aspect of the fight on the ground and picked up a submission victory via rear naked choked in just 60 seconds flat. The legend begins. That MMA went about as well for Halme as it for the Bam Bam Bigelow fight we reviewed on the podcast last year. The way Halme immediately galloped straight into the takedown also reminded me of CM Punk’s MMA debut against Micky Gall. We get a UFC flashback to ‘UFC 7’, which was our first MMA podcast, with highlights of Marco Ruas defeating ECW shootfighter Paul Varelans. Joe Rogan informs us that Enson Inoue is out of the lightweight tournament finals due to and injury, citing vision problems. Tito Ortiz, the winner of the earlier alternate bout, is in. The announcers explain that Ortiz is still in college, so is fighting as an amateur and isn’t even being paid for fighting tonight. They decide to show us the full alternate bout, which is the first UFC fight I’ve seen not refereed by Big John as Joe Hamilton takes charge. Tito picked up a 31 second victory over Wes Albritton after his corner rightly threw the towel in. This fight could have stopped a lot quicker with Hamilton slow to react as Tito reigned down with brutal punches, elbows and hammerfists. He looked like an animal in there. We return to the regular show and it is time for the Lightweight finals as Tito Ortiz takes on Guy Mezger. Ortiz is really over with the crowd in the arena. This was a great fight, with a lot of drama. The first minute was chaotic, with Tito in complete control. He secured a front facelock and landed some vicious looking knees to the head, with the announcers incorrectly calling that Mezger may have tapped at one point. After 66 seconds, McCarthy broke things up to check a couple of significant cuts on the side of Mezger’s head. After the action restarted, Ortiz shot for the takedown and left his head up, meaning Mezger was able to secure a guillotine and pull guard. He locked it in tight, and Ortiz taps after exactly 3 minutes to crown Mezger the UFC 13 Lightweight Tournament winner. Both guys came out of this fight more over with me than they were heading into it. Mezger did exceptionally well to turn his fortunes around and come back to win this from a very precarious position, and Tito, the 22 year old amateur, showed a hell of a lot of potential in the first half of the fight. With that we move swift into our heavyweight tournament final between Steven ‘3D’ Graham and Randy Couture. As we all know, the best is yet to come with Randy Couture, but this was superb. Couture was able to take the much larger man down very quickly, but Graham showed exceptional manoeuvrability for a man of his size scrambling as he tried to escape. Couture shows incredible strength as he holds Graham in place. After some picture perfect transitions, Couture spun behind and took Graham’s back; getting both hooks in and flattening Graham out. He rained down with strikes to the back of the head and Big John dived in after 3 minutes and 13 seconds to crown Randy Couture the UFC 13 Heavyweight Tournament winner. This was the most elite display of wrestling I have seen in the UFC up until this point. Mark Coleman is close, but is often the larger man in his contests. Couture had a 65lbs weight disadvantage. I would love to have seen this Randy Couture take on the Mark Coleman of 1996. Before we get to our main event, we cut to another UFC flashback. We take a look back at both Tank Abbott at the Ultimate Ultimate 96 and Vitor Belfort’s showing at UFC 12. They’ve really played up the face/heel dynamic here, with Belfort always respectful in his pre-fight promos and Abbott talking smack how only he can at every opportunity. This was as good a 53 second fight you are ever going to see. Vitor gets a takedown to start us off, but Tank manages to scramble out, grabbing Belfort ankle and tripping him onto his back. Abbott decides to stand off and let Vitor back to his feet. Back on the feet, Vitor opens up with his trademark machine gun punches, putting Tank down. Tank covers up while lying on his stomach and Vitor gets behind him. Tank tries to roll away but is unable to do so and ends up flat on his front again. Vitor continues to punch away, and after just 53 seconds Big John McCarthy jumps in to declare Vitor the winner. Vitor’s entourage again chant ‘jiu-jitsu’ but despite his 3 incredible UFC performances we are yet to see Vitor have to demonstrate any of his BJJ prowess as he can just put people away with his exceptional striking. His hand speed is sensational; he is the best striker we’ve seen in the UFC up until this point. You can really see why people make such a big deal out of ‘the old Vitor’ and he is even an exceptional promo for his age/nationality, thanking the fans and all his team. He seems so natural in this sport. He cuts an exceptional promo for his age, in his second language of English to close out the show. If you want to a watch a full UFC show in 2017, from prelims to main event, you’re signing up for a 6 hour stint. This show felt like a breath of fresh air as it flew by, feeling slick and watchable. I enjoyed mostly everything on it, the production values were the best they’ve ever been, but there were no instant classics. The only thing holding this back is the lack of a ‘great’ fight, but there are no bad fights on this show. This is almost required viewing for the historical significance regarding the debuts of both Randy Couture and Tito Ortiz as well as the development of Vitor Belfort. Listen to our February 1997 UFC podcast, reviewing UFC 12: Judgement Day. Live from Dothan Alabama, it’s UFC 12: Judgement Day, the first ever UFC show with weight classes on which we will crown the first ever UFC Heavyweight Champion. Our hosts for this evening are Jeff Blatnick and Bruce Beck, who introduce the new format for the show consisting of two separate four-man tournaments, based around two weight classes, one for those above 200lbs and one for those below 200lbs. They run down the four man tournament bracket for the lightweight division featuring a familiar name in Jerry Bohlander and 3 UFC debutants. 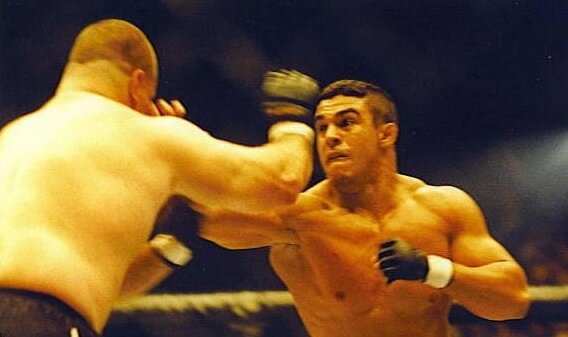 On the Heavyweight side of things, the only fighter we have previously seen in the UFC is Scott Ferrozzo, but there is a very noteworthy UFC debut for non-other than 19 year old Vitor Belfort. Our main event for the evening is of course Mark Coleman vs. Dan Severn, which will determine the first ever UFC Heavyweight Champion. The two alternate bouts saw Nick Sanzo defeated Jackie Lee via TKO in 48 seconds in the lightweight division. In the heavyweight division Justin Martin defeated Eric Martin via submission in just 14 seconds. We cut backstage to the meet the newest member of UFC’s broadcast team, and it is none other than Joe Rogan! I had no idea he was involved as early as this. Rogan will be interviewing the fighters as they come out of the Octagon. In the semi-finals of the two tournaments we have a 12 minute time limit with a 3 minute overtime optional, and a 15 minute time limit with a 3 minute overtime period in the finals. We kick things off with the Lightweight tournament semi-finals. Rainy Martinez, seen here making his MMA debut, comes from an amateur wrestling background but is also 9-0 as an amateur kickboxer. He weighed in at 195lbs. His opponent, Jerry Bohlander, enters with a 2-1 UFC record, with one of those victories coming against heavyweight tournament fighter Scott Ferrozzo. The 22 year old submission fighter weighed in at 199lbs. Ken Shamrock joins the commentary team for the lightweight division with a special interest in this fight as he is a teammate with Bohlander fighting out of the Lion’s den. Manny Garcia runs through the formal introductions and Big John McCarthy gets us underway. Bohlander quickly throws some leg kicks before jumping in for the takedown attempt. Martinez tries to sprawl but Bohlander is able to get him down against the cage. Bohlander is in side mount, and as both men scramble he moves into half-guard. Martinez is able to roll out and briefly gets back to his feet, but Bohlander swiftly takes him back down into the fence in side mount. Martinez rolls and gives up his back, and Bohlander quickly gets his hooks in and locks in a rear naked choke to get the submission victory in just 1 minute 18 seconds. Good performance from Bohlander here, but I don’t know what the hell Martinez was thinking rolling the way he did and giving up his back. A short fight that was mostly fine. Rogan interviews Bohlander backstage, who credits the victory to his previous experience in the Octagon and says it’s nice fighting guys his own size as he can show his technique. Wallid Ismail, making his UFC debut, is 4-0 in MMA. He is an 8 time Brazilian Jiu-Jitsu champion and weighed in 182lbs. After a tentative opening, Takahashi lands a few strong punches and shoves off a takedown attempt from Ismail. Ismail grabs on and they grapple for position. Takahashi is basically giving Ismail a wedgie here, grabbing the back of his shorts for leverage. Ismail tries a takedown, but Takahashi grabs the fence to prevent it. Big John repeatedly shouts ‘let go of the fence,’ but Takahashi seemingly doesn’t understand. Ismail is still trying for the takedown but Takahashi has control in a front facelock. He releases that to grab the fence yet again. Ismail transitions into a rear waistlock and tries to pull Takahashi down, who avoids this by hanging onto the fence. Big John is fuming, this time physically removing Takahashi’s hand from the cage. Ismail then successfully gets the takedown with a trip. Takahashi is quickly able to work back to his feet, before landing some punches inside the clinch before both fighters separate. Ismail presses forward, but Takahashi lands two right hooks which drop the Brazilian. Instead of following up, Takahashi starts yelling at McCarthy to administer a standing 8 count, as would be the case in Pancrase. The fight continues with both guys on their feet, with Ismail pressing forward Takahashi doing all the damage with some crisp counters. Ismail eventually shoots in again, but Takahashi sprawls and uses the fence to keep himself up again. Ismail is working for the takedown and Takahashi is continuously using the cage to keep himself up. Takahashi then proceeds to tear the protective cup out of Ismail’s shorts and land some strikes to the groin. I know it isn’t against the rules but how dirty a fighter is Takahashi? Takahashi continues to hold the fence, leading to McCarthy physically removing it yet again. Ismail looks for the single leg, but Takahashi is able to counter with an ankle pick and gets on top in Ismail’s guard. He lands a combination of hammerfists, and headbutts. This continues to the end of the 12 minute regulation period. Ismail looks absolutely spend and his face is a mess. As they prepare for overtime, McCarthy tells Takahashi he is not allowed to hold the fence. We are underway in overtime. Both fighters stand in the centre with no action for the first 30 seconds. Both fighters then trade a few punches, before Takahashi attempts to call a time out, citing a poke to the eye. McCarthy ignores this and orders them to continue. Ismail is out on his feet here, barely moving. Takahashi closes the distance and lands some nice shots, which drops Ismail. Takahashi then throws, and lands an illegal kick. It is illegal because he is wearing shoes. McCarthy signals that this move should be noted by the judges. Ismail looks really wobbly, with Takahashi landing the occasional combination as the fight comes to an end. We go to the judges, who give Takahashi the win via unanimous decision. That was really frustrating to watch. Takahashi clearly had no idea about any of the rules. That being said, nothing about grabbing the cage was mention when we ran through the rules at the beginning of the night. Big John was certainly acting like it was illegal, and it played a big part in the fight, with Ismail expending a lot of energy trying to get to the takedown only to have Takahashi hold on to the fence. Calling for time out, and standing eight counts in the middle of this fight was all rather comical. Pulling the cup out, while not against the rules, was just so dirty. With that we move into the heavyweight tournament semi-finals, with Tank Abbott joining the commentary team, telling us he isn’t here for the ‘small time kiddy category, just here for the heavyweights’. Jim Mullen, seen here making his UFC debut, has a 0-1 MMA record. He has a 16-1 record in professional kickboxing, and is said to have knockout power. He weighed in at 215lbs. His opponent, Scott Ferrozzo is coming off a unanimous decision victory over Tank Abbott at UFC 11. He has a 2-1 UFC record and weighed in at 323lbs. So despite the introduction of weight classes here, Scott Ferrozzo has a 108lbs weight advantage here. Ferrozzo swarms in and charges Mullen back to the fence early. He uses the huge weight advantage to press Mullen into the cage, landing the occasional knee. Ferrozzo lands some heavy uppercuts but Mullen doesn’t go down. Ferrozzo locks in a front facelock and forces Mullen to the ground. He lands some hard knees to Mullen’s head. Ferrozzo continues to grind Mullen down, landing knees and short punches and dominating with his weight. Mullen is able to stand by Ferrozo quickly grabs him and slams him down to the guard. He passes into half guard and keeps Mullen pinned down with a forearm across his throat. Ferrozzo is really breathing heavily here, as he just attempts to smother Mullen. McCarthy calls for a pause to the action so they can check the swelling over Mullen’s left eye. The action restarts, and Mullen lands a good left hand, but then attempts a spinning elbow as Ferrozzo charges through him and sends him into the fence. He drops three heavy knee’s to the head and that is enough for the stoppage via TKO after 8 minutes and 2 seconds. This was like a fight you would see before the introduction of these weight divisions. Mullen had a good kickboxing record but we never got to see if he was decent standing because Ferrozzo just smothered him with his huge weight advantage in a comfortable victory. Tra Telligman is a submission fighter with a 3-0 MMA record making his UFC debut. He is known for fighting despite having only one pectoral muscle. He trains out of the Lion’s den and weighed in at 233lbs. His opponent, Vitor Belfort, is making his UFC debut but enters with a 1-0 MMA record. In the modern day, the ‘phenom’ holds the record for the most knockouts in UFC history. The Brazilian Jiu-Jitsu specialist weighed in at 205lbs. As Vitor makes his way to the Octagon, the announcers talk about how the 19 year old has the potential to be a long term great in the UFC. Vitor takes the centre of the octagon immediately, with Telligman taking a more cautious stance circling his opponent. This draws quick criticism from Tank Abbott, who says he knows Vitor can let his hands fly. Almost on cue, Vitor unleashes a lightning quick combination which tags Telligman. Tray tries to clinch, but Vitor breaks off, and lands his trademark machine gun punch combination, landing an incredible amount of shots in quick succession. Telligman looks for the clinch again, but Vitor knocks him down with a huge left hand, quickly dropping down into side mount. From there, he lands a series of lefts followed up with some horrible looking elbows for the head for the stoppage after just 1 minute and 17 seconds. After the fight, Tank Abbott says that Belfort looked sharp but it was more of a reflection on who he fought. He says he is interested in seeing how he develops, I wonder if he knew at this stage he was being lined up to take on Belfort at UFC 13. We haven’t seen striking executed with that combination of skill and speed in the UFC. What makes it all the more impressive is the fact it came from a 19 year old Brazilian Jiu-Jitsu champion. A fantastic debut for Vitor, who made short work of an opponent who was no match for him. Next up, we see a video package covering Mark Coleman and his training for the heavyweight title fight in the main event. He says he thinks the fight will come down to who has the most heart. He feels he could have won the Ultimate Ultimate 96 and it was difficult for him to watch. Backstage, Joe Rogan announces that Takahashi is out of the lightweight tournament finals due to a broken hand. Alternate Nick Sanzo is taking his place after his 48 second victory earlier in the night. Ken Shamrock re-joins the commentary team for the lightweight finals. Jerry Bohlander comes into the final with a 3-1 UFC record, weighing in at 199lbs. His opponent, Nick Sanzo, made his MMA debut earlier in the night, so enters this final with a 1-0 record. He is a Jiu-Jitsus specialist and weighed in at 199lbs. Sanzo opens up with a quick takedown attempt, but Bohlander is able to scramble, block and get in a front facelock. He lands some knees to the head, locks his arms across the back of Sanzo’s neck and rolls through into a crucifix neck crank for the submission victory after just 48 seconds! Shamrock claims to have worked on it with Bohlander three weeks ago. Joe Rogan interviews a delighted Bohlander, who has become the first ever UFC Lightweight Tournament winner. Bohlander says he wants to keep getting better and keep winning. Rogan asks him who he would like to fight, and Bohlander says he really wanted Takahashi, but would fight anyone who steps into the octagon. Before we get to the heavyweight tournament finals, we have a video package covering Dan Severn. He says there isn’t a moment he isn’t thinking about this fight and running over different scenarios. He says the beast is here, the beast is crazy and the beast wants to perform. He has no animosity for Mark Coleman, for him this is all about competition. Vitor Belfort enters this final with a 3-0 MMA record. The 19 year old weighs in at 205lbs. His opponent, Scott Ferrozzo has a 3-1 MMA record and weighs in at 323lbs, giving him a 118lb advantage in this final. Tank Abbott re-joins the commentary team, saying that while it seems Belfort has great hand speed, that doesn’t mean he has any power behind his punches, and we’ll have to see how ‘the rotund one’ can handle them. We are underway in the final, and Ferrozzo taunts Belfort as we begin. Ferrozzo presses forward, and Belfort cracks him with a lightning quick left, following up with an even faster left hand which drops Ferrozzo face first onto his stomach. Belfort dives straight onto him. They scramble and Belfort gets a rear waistlock. He begins unleashing hard powerful punches to Ferrozzo’s head, and Big John stops the fight right there after just 43 seconds. Ferrozzo, seemingly completely out of it, grabs Belfort and tries for a single leg, which takes Big John and another official forcing him off. Belfort and his enormous entourage celebrate, all chanting ‘Jiu-Jitsu’, despite Vitor Belfort needing to show almost none of his BJJ skills on his way to winning this tournament. Vitor demonstrated some more incredible hand speed with the two left hands which dropped Ferrozzo. When people talk about the ‘old Vitor Belfort’, this is the guy they are referring to. A seriously awesome performance throughout the tournament, which he won almost entirely with exceptional stand-up skills, but knowing how well versed he is on the ground is a scary proposition. He entered the UFC and made a real statement to everyone in the organisation on his first night. Don Frye replaces Abbott on the commentary team. He says that the people have been robbed as he is unable to compete due to a broken hand, which caused the commission to cancel the fight between him and Severn. He thinks the main event will be a close one, but he leans towards Severn. It’s time to crown the first ever UFC Heavyweight Champion. Mark Coleman enters this fight 5-0 in the UFC, with his last appearance coming back in September 1996 as he won the UFC 11 tournament. The freestyle wrestler weighed in for this one at 240lbs. His opponent, Dan Severn enters this fight with a 14-2 record in MMA, with his last UFC appearance the infamous split decision victory over Ken Shamrock back at UFC 9. He has fought 5 times since then, and is on a 9 fight win streak. He weighed in at 260lbs. After a tentative opening, Severn shoots in for a takedown but Coleman is able to sprawl and grab a front facelock, with both guys coming up standing. Coleman avoids another takedown attempt, landing a crisp right hand as Severn comes in. Severn shoots again, but Coleman blocks it and ends up on top in full mount. Severn quickly rolls out of it and Coleman grabs a rear waistlock. Coleman lands a few short rights to the back of Severn’s head, so he tries to roll out of the position but Coleman ends up on top in full mount. Coleman lands a few rights to Severn’s ribs, before transitioning into side mount and locking in a side headlock. Severn tries to fight back, landing some weak looking strikes to the top of Coleman’s head as well as jamming his hand into his face and eyes, but Coleman keeps the neck crank locked in and eventually Dan Severn taps out after 2 minutes and 57 seconds, making Mark Coleman the first ever UFC Heavyweight Champion. I was definitely expecting this to be a bit more even, but Coleman dominated this whole fight. Severn kept looking for a takedown but never looked like getting it because Coleman was just far too dominant with his wrestling. This is the last time we’ll see Dan Severn in the UFC until September 2000, so this sort of signified a passing of the torch between the best wrestlers the UFC had seen up until this point. This was the same way Coleman finished Jullian Sanchez at UFC 11, but this was clearly a much higher calibre opponent so this was mighty impressive. I love watching Mark Coleman fight, he has by far been my favourite fighter going back and covering MMA from this era. Joe Rogan interviews Mark Coleman, who says he is very proud to be a wrestler and he doesn’t believe any could take him down. He says whoever the fans want to see him fight, he will fight, but he would like to take on Don Frye in a rematch next. Listen to our December 1996 UFC podcast, reviewing UFC Ultimate Ultimate 1996. Live from Birmingham Alabama, billed as the ‘Tournament of Champions’ we have UFC 11.5, more commonly known as The Ultimate Ultimate 1996! The premise behind this show is pretty much the same as the original Ultimate Ultimate last year, with some of the most popular UFC Fighters of the year in one elimination tournament. The winner will receive $150,000 as well as a shot at Superfight Champion Dan Severn at UFC 12. Our host, Bruce Beck, opens the show by explaining that Mark Coleman has been forced to withdraw due to a virus, much to the relief of every other fighter in this tournament. However, we still have a pretty stacked field, featuring Don Frye, Ken Shamrock, Tank Abbott, and Kimo to name a few. Joining Bruce Beck we have Jeff Blatnick, and Tony Blauer, who discusses how many of the top fighters in the UFC are now training in multiple disciplines and as a result are becoming increasingly multi-facetted and well rounded. We had three alternate bouts for this tournament, with the idea being to guarantee avoiding a repeat of the anticlimactic finish to UFC 11. First up, Mark Hall defeated Felix Mitchell by TKO in 1:45. Steve Nelmark defeated Marcus Bossett in just 1:37 by submission and Tai Bowden defeated Jack Nilson, also by submission. Brian Johnston, wearing his signature American flag trunks, enters the tournament with a 2-2 record, a losing semi-finalist at both UFC 10 and UFC 11. The kickboxer stands at 6”4 and weighs in at 238lbs. Ken Shamrock enters the Ultimate Ultimate with a 5-2-2 record in the UFC (23-5-2 MMA). The first ever UFC Superfight Champion makes his first appearance since his infamous split decision loss to Dan Severn at UFC 9 in May. The smaller man here, Shamrock stands at 6”0 and weighs in at 220lbs. Both these guys are looking much bigger than normal. We are told Johnston will look to keep things standing, but Shamrock is a master of submissions and will look to take the fight to the ground. Once again, we have no Bruce Buffer, with Manny Garcia running through the formal introductions. Big John McCarthy gets us underway! After a brief feeling out process, Shamrock catches a kick from Johnston and drives him back towards the cage, taking him down in the process. Johnston gets guard, but Shamrock postures up and begins pummelling through it with some heavy punches. Johnston has his head pinned against the cage and looks in real trouble here. Shamrock continues to reign down with hard shots from the top, and Johnston doesn’t look like he is going anywhere anytime soon. Johnston absorbs a plethora of right hands as he desperately tries to hold on. Shamrock is just grinding him down, taking no damage as he tries to power his way through and end this fight as quickly as possible. The commentators note that Shamrock seems to have ‘punched out his right hand’ as he is now only throwing strikes with his left. More on that later. At the five minute mark, Shamrock begins landing some brutal looking headbutts. Shamrock shoves his forearm across the throat of Johnston and presses down hard, and Johnston taps out there after 5 minutes and 48 seconds. Really dominant performance from Shamrock. He overpowered the larger man with relative ease. Johnston is a bit of a conundrum, he now has a 2-3 record, his losses coming against Frye, Coleman and Shamrock who are all top guys, but he has looked really impressive against people just below that level. Don Frye enters the Ultimate Ultimate with a 6-1 record, coming off his loss to Mark Coleman in the UFC 10 final. He has previously defeated Gary Goodridge via submission in just 2 minutes and 14 seconds in the final of the UFC 8 tournament. The 31 year old weighs in at 217lbs, the much smaller man. Gary ‘Big Daddy’ Goodridge enters the tournament with a 3-3 record, and he is also coming off a loss to Mark Coleman at UFC 10. He weighed in at 263lbs. The size difference is unlikely to faze Don Frye, who was the victor of the David vs. Goliath UFC 8 tournament final between the two men. Just as the fight is about to start, Bruce Beck announces that he has just received word that Ken Shamrock is out of the tournament due to injury and will not advance in the tournament. We aren’t given a reason, but it is later revealed that it is due to an injured hand. Shamrock had apparently suffered a broken right hand while reigning down punches with Johnston pinned against the cage, which explains why he switched to his left hand during the opener. Steve Nelmark will take his place. They meet in the middle; Frye lands a right hand as they clinch. Frye forces Goodridge back against the fence, landing a knee and some uppercuts inside. Goodridge is able to counter, spins and pushes Frye back against the cage, using his size to his advantage. They break off, and after a brief exchange they clinch again. Both men trade uppercuts in the clinch, before Goodridge lands a knee to the body which backs Frye off. They separate in the centre of the octagon, but Frye ties it up and drives the action back against the cage. Both men are landing their fair share on the inside. Blatnick notes how Frye is able to use Goodridge’s Gi to his advantage by holding onto it to control Goodridge in the clinch. Holding onto the collar of the Gi, Frye unleashes a flurry of uppercuts which all land cleanly. Goodridge closes the distance in the clinch and recovers quickly. Out of nowhere, Goodridge is able to get a really surprising takedown into side control. Frye scrambles into half guard and holds on tight. Goodridge lands a powerful right hand and follows it up with some short headbutts. Frye looks in trouble here. Frye manages to transition into full guard. Goodridge isn’t really doing much here. Suddenly, Frye looks for an armbar from the bottom in a lovely submission attempt, but Goodridge is able to avoid it. Goodridge is looking exhausted despite being on top here. Frye looks for another armbar and rolls through onto all fours as Goodridge avoids it. Frye grabs a single leg and is able to take Goodridge down and put him on his back. Goodridge immediately taps out in that position after 11 minutes and 19 seconds. It was really impressive that Frye was able to survive on the bottom for as long as he did, yet alone being able to escape and take Goodridge down. Pretty anti-climactic ending to an exciting fight, but Goodridge was exhausted and didn’t want to take any unnecessary punishment when he knew he would be unable to defend himself. Tank Abbott enters the octagon with 4-3 record, coming off a loss to Scott Ferrozo at UFC 11. The ‘streetfighter’ weighs in at 273lbs, having lost 25lbs since his last fight. The announcers are pushing this one as the ‘Good Guy vs. The Bad Guy’. I was initially sceptical of how Worsham qualified for this tournament, but I think he was the Mark Coleman replacement. Winner of this goes on to face Shamrock replacement Steve Nelmark. Worsham throws a big right hand to open, but Tank charges forward swinging and forces Worsham back into the fence. Worsham lands a hard knee to the body, but Tank lifts him up attempting the takedown and nearly throws Worsham out of the cage. Worsham hangs on to the top of the octagon desperately, but eventually ends up on his back in the guard. Tank gets into side mount, manoeuvres for position before standing and diving back into the guard. Worsham manages to defend a barrage of strikes from Tank. Tank slowly grins his way through, lands a couple of big punches and Big John steps in to end the fight after 2 minutes and 51 seconds. Worsham goes nuts after the right, charging forward towards Tank, and Big John has to man handle him and hold him back. Worsham is clamouring for Tank to be disqualified, with Big John telling him to ‘knock it off’. Replays eventual show that Worsham tapped out after Tank landed the first big right hand, but as McCarthy was stepping in, Tank continued to throw, and land more punches for good measure. You can understand Worsham’s frustration there, but I’m not sure DQ is particularly justified. Crazy start to the fight with Worsham nearly being thrown out of the octagon which provided a stunning visual. After that, Tank just ground him down fairly comfortably. There were a few late strikes by Tank but they didn’t seem significantly late, there would be no justification for the DQ there. Kimo enters this fight with a 0-2 record in the UFC, but is 5-2 in MMA. The pankration specialist has dropped a lot of weight since the last time we saw him, in a loss to Ken Shamrock, weighing in for this one at 235lbs. His opponent, ECW shootfighter Paul Varelans, enters this with a 4-3 UFC record, coming of a decision victory at UFC 8 in February. He is by some distance the heaviest man in the tournament, weighing in at a mammoth 340lbs and standing at 6”8. We are underway and Kimo shoots for a single leg immediately, but Varelans sprawls back and lands some elbows to the head. Kimo is actually able to overpower the much larger man, and forces Varelans towards the fence. Varelans is able to avoid the takedown and land some punches of his own. Kimo tries a shoulder throw, pretty inexplicably, and just ends up on the bottom in half guard. Varelans lands some hard left hands, and is able to avoid an armbar attempt from Kimo by clubbing away with his right hand. Varelans end up back in Kimo’s guard and continues to reign down with punches. Kimo is cut and bleeding quite badly by his left eye. Varelans begins to slow down his strike rate, clearly tiring, and Kimo continues to survive on the bottom. The fight continues in this pattern for some time, with Kimo hanging in there and landing some of his own strikes from the bottom. Suddenly, Kimo is able to slide out to the side and reverse into full mount. He opens up, unleashing some heavy punches to Varelans face to earn the TKO victory when Varelans corner throw in the towel. The crowd pop big for that finish, having been behind Kimo throughout the fight. What a fantastic performance from Kimo, who looks absolutely exhausted after the fight. Varelans didn’t have the skill to do anything once he had Kimo down, but Kimo showed amazing heart to survive to over 100lbs weight difference, escape the bad position and come away with the victory. Both guys are absolutely spent. We are shown highlights of Steve Nelmark’s alternate victory earlier in the evening, with him successfully getting a takedown, landing a brutal flurry of headbutts before securing the submission victory. Tank comes out fast with a big left hand, backs Nelmark against the cage and lands a huge body slam down onto Nelmark’s head right out of the gate. Nelmark grabs a headlock in half guard, but Tank powers out and the action goes back standing. Tank lands a brutal barrage of punches, which send Nelmark staggering backwards. Tank presses forward and lands a huge right hand which knocks Nelmark out cold. He drops at a sick angle, which is difficult to watch, with his neck bent at seemingly 90 degrees against the fence. The fight is over after just 1:03. That was so devastatingly brutal. The camera cuts away from Nelmark as Tank Abbott is officially declared the winner, and there is real concern about Nelmark’s wellbeing here. Eventually, Nelmark is able to be helped to his feet and the tension is relieved. The visual of that knockout was sickening. A wild, frantic fight that is typical of what you get from Tank Abbott. The angle of nelmark’s head and neck against the cage is haunting. Scott Ferrozzo interview: Ferrozo cuts a stero-typical arrogant heel style promo, wearing shades for good measure. He says he is frustrated that he isn’t in there whopping Tank Abbott again. He says he is being held back by the UFC brass because he doesn’t fit their profile of a star. He says he doesn’t want to discuss his losses because they are history. Beck is rebutting almost everything Ferrozo says. This was such a hilarious segment. Mark hall is in replacing Kimo who was withdrawn due to exhaustion. These two guys have fought twice before, once in the UFC and once in Japan, with Don Frye winning both fights. Frye took nearly 11 minutes to defeat Mark Hall back at UFC 10 in July. Hall valiantly held on as Frye pummelled away at his ribs on the ground in that one. We are underway. Hall comes forward into the clinch right away, but Frye grabs him and is able to get the takedown straight away. They stand; Frye grabs a leg, drops down and is able to get a heel hook for the victory in just 20 seconds. Paul Varelans appears and helps Hall out of the octagon, who seems to be in great pain. There is a lot of controversy about this fight. Mark Hall would later claim Don Frye and his manager came into his dressing room before the fight, and convinced him to throw the semi-final. Hall says that Frye was concerned that Tank Abbott had advanced to the finals so quickly, whereas Frye had been in there for over 11 minutes in the quarter final alone, and he wanted to save his energy for the final. Frye and his camp implied that, before Frye had already defeated Hall twice in recent months, he was most likely going to win anyway and another loss to Frye wouldn’t significantly impact Hall’s career. Hall says he reluctantly agreed to go alone with it. Big John McCarthy commented on this in his autobiography, saying; “This was the second time in my life I felt I was refereeing a fixed bout. In their UFC 10 bout, Frye had had to beat the piss out of Hall, who refused to give up. Here though, Frye ankle locked him to advance without breaking a sweat. It struck me as odd. Frye was a bread-and-butter wrestler and swinging for the fences puncher, he had never won a fight via leg lock. Hall practically fell into the submission. It also struck me how both fighters were managed by the same guy’. If this was fixed, there was some good pro-wrestling style selling from Hall at the end, a lot of modern day wrestlers could learn a thing or two from it! Frye comes out looking to box, but Tank comes in and catches him on the chin with a left jab, sending Frye staggering backwards and tumbling down. Tank smells blood and closes in looking to finish the fight but Frye is able to get to his feet with both men landing wild punches. Tank gets the better of these exchanges as Frye is busted open. Frye looks in serious trouble here and Tank continues to land bombs. I have no idea how Frye is still standing. This is an absolute slugfest. Suddenly, Tank slips as he misses with a wild swing, and Frye quickly pounces on his back. Crowd are going mental. Frye is able to sink in the rear naked choke, and Tank Abbott taps out after just 1 minute 22 seconds. Don Frye is the Ultimate Ultimate 1996 Champion. What a fight that was! Tank was landing some bombs, I couldn’t believe Frye wasn’t going down. That was some serious heart he showed. As soon as Tank made a mistake, however unlucky it was, Frye capitalised on it immediately and it paid off in the biggest way possible. Post-fight interviews: Don Frye confirms that Tank Abbott does infact hit like a mach truck. He says Tank is an animal and he thinks he has a broken hand by punching Tank’s head. Tank Abbott is asked if he respects Don Frye following that fight, and he replies ‘nah, I don’t respect anybody’. Fair enough. We come to an end of the show with a plug for the upcoming UFC 12 PPV, which is scheduled to feature Dan Severn vs. Don Frye. This was an exciting show despite injuries and withdrawals robbing us of a few really mouth-watering matchups in Frye vs. Kimo and Tank vs. Shamrock. Despite that, the actual action inside the octagon was all great. There are loads of talking points throughout the cards filled with marquee names. None of the fights went the distance, and the Nelmark KO is one of the most brutal in UFC history. I would highly recommended this show.